Application Examples at any time without prior notice. hereof is prohibited without the expressed consent of Siemens Industry Sector. inverter and control and to run the drive with the control. The SINAMICS G120 is to be controlled from an S7-300 CPU via Profibus. and the appropriate configuration in the SINAMICS G120. In Chapter 3 the required hard and software components for the functionexamples are shown. Chapter 6 informs about the key performance date. you with the creation of your own projects. example is provided in the Chapter. mechanical brake. This training case can be ordered by specifying Order No. The functionality was tested with the specified hardware components. Similar components that are different from those listed above can be used. example (e.g. setting other addresses). injury or significant material damage. Control Unit (CU) or the Power Module (PM). PM) to prevent them from being replaced by unauthorized personnel. Most of the module/board settings are made in the HW Config in the software. Hardware settings are only required for the following modules/boards. The modules/boards must be set with the control system in a no-voltage state. between the series of switches. Using the DIL switch, set address 10 as shown in the following diagram. interface of your PG/PC and the MPI interface of the S7 CPU. De-archive the function example supplied. Open HW-Config and download this into the control. After the download reclose HW-Config. click on the Inbetriebnahme icon. connection to the drive inverter. 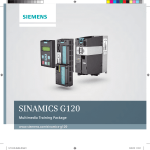 download the SINAMICS G120 drive parameters. loading, copy RAM to ROM". Chapters so that you will then be in a position to implement your own project. For this function example, the settings described no longer have to be made. clicking once on the SINAMICS G120 icon (1.). PROFIBUS – and to register (log-on) the device to the engineering tool. for this communication; these can be selected from the hardware catalog. adapted to the particular application. G120 (refer to Chapter 6.5). (1.) To parameterize the telegram, first select an Out-input range for I/O Type. called in the cyclic program (OB1). In this function example the individual data of the DB1 are supplied in FB10. This block is called-up in absolute terms in OB1 and in turn calls up FC100. Controls the SINAMICS G120 via the axis-DB, DB1. Calls the SINAMICS G120 control block FC100. This network can be used as template for additional SINAMICS G120 control functions. Controls the signal lamp for fault. SINAMICS G120 is controlled using the FC100 via PROFIBUS. addresses - this is the reason that instances can be used. Opens the Axis_DB specified using the formal operands Nr_Axis_DB. Generates the internal error message. Enters SINAMICS G120 error and alarm number into the Axis_DB. Program > SINAMICS select a SINAMICS G120 type object. Make the following settings and press the OK button. to establish an online connection to the drive inverter. Configuration in the Project Navigator. by pressing on the Help button. function Ident. of al param. in standstill incl. the saturation curve (3). setting and calculate motor data. instead press the Finish button. axes the load must always be supported. menu item Commissioning and activate by double clicking on Control panel. information and instructions. Then activate Enables. data identification routine will be interrupted for safety reasons. using Communication -> Profibus. Select the tab Transmit direction. To start, select the Standard-Telegram 350 (350) from Message frame: (1.). Then replace telegram 350 by telegram type Free BICO connection (999) (1.). Please wait until the download operation has been completed.